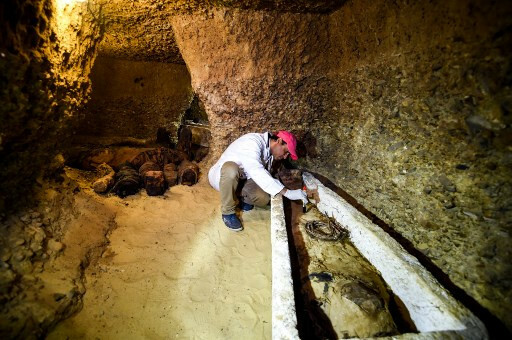 A sarcophagus believed to contain an Egyptian nobleman will be opened on live TV during a special broadcast by the American channel Discovery. The two-hour "Expedition Unknown: Egypt Live" will air Sunday night (0000 GMT Monday) from the site outside Minya, which is along the Nile River south of Cairo and its Giza pyramids. The country's Supreme Council of Antiquities declined to comment, even though Discovery announced that council head Mostafa Waziri would be present for the event. The site containing the sarcophagus was discovered in February last year, and a Discovery spokesman told AFP that the project was set up in collaboration with Egypt's antiquities ministry. Archeologists at the site recently discovered a network of vertical shafts leading to a network of tunnels and tombs containing 40 mummies "believed to be part of the noble elite". In one of those, a limestone sarcophagus holding a 3,000-year-old mummy is to be opened during the show. She said the broadcasters should not open the tomb without providing solid archeological context, but "the main problem" is something else. "If money is being paid by a major channel to the ministry to show antiquities, where is it going to end up?" the archeologist asked. That still falls far short of the 14.7 million tourists in 2010. In Washington, a separate exhibition has opened focusing on the "Queens of Egypt". Discovery said that its broadcast will be simulcast on the Travel and Science channels.